I grew up in a small little town in Northwest Iowa that was settled by Irish immigrants. And even though I don’t remember my Mom ever making a Classic Shepherds Pie, I know I had it at friend’s houses. It was just kind of a staple that pretty much everyone made. Classic Shepherds Pie was just the kind of meal that people whipped up that was good, hearty and filling and simple enough to practically make with your eyes closed! And it’s the kind of down-home meal that appeals to just about everyone from child to adult. I mean, even if you don’t like, say peas (yeah, I’m kinda a hater) all will be redeemed by that mashed potato topping! First of all, no one ever used a recipe for Classic Shepherds Pie – I think the making was passed down in some ancestral sequence of DNA. It wasn’t until I was much older that I learned that some draw a distinction between “Cottage Pie” made with beef, and “Shepherd’s Pie” made with lamb. To us, in our little Irish town, the name Shepherd’s Pie referred to the dish, and it didn’t really matter what it was made with, so that’s what I call it. It’s funny, btw, that the distinction between Shepherds and Cottage Pie is a new one, and according to “The Unexpected History of Shepherds Pie” started around 1939. So there, take that, lol! But enough of that, let’s talk about the Classic Shepherds Pie. There are really two different ways to make Shepherds Pie. The really centuries-old way is to use leftovers, minced beef or lamb, possibly gravy and a maybe a few veggies, all topped with mashed potatoes, like my Leftover Pot Roast Shepherds Pie. And it’s so delish. Those who didn’t have leftover roast had to make do when they wanted to make the Classic Shepherds Pie. The dish would be put together with ground beef or lamb (which in Britain is referred to as a “mince”), onions and carrots and peas & of course, that mashed potato topping. Those simple flavors all meld together in an almost a magical alchemy. Sometimes, with all the global flavors available, the exotic spices and bacon this and bourbon that, and the layers and layers of flavor we cook can cook with today, we can forget just how good the simple taste of just plain food can be! Smart cooks learned to put this dish together when mashed potatoes were leftover or to make more when they were cooking mashed potatoes early in the week, and then they could skip that extra step of boiling and mashing the potatoes just for this Classic Shepherds Pie. But then the long decline began. People started taking other shortcuts and started making Shepherd’s pie with frozen mixed veggies (frozen peas are ok in this) or canned Veg-All and instant mashed potatoes. As you can guess, Shepherd’s pie fell out of popularity in many homes. Creative cooks, though, learned to elevate the dish – simple changes like a bit of cheese in or on top of the potatoes were appreciated by many. Tomato paste thickens some, sometimes a little wine can fancy it up. Worcestershire Sauce and herbs came into play. Pearl onions became available and were often added and good cooks started taking a bit of care with the ingredients. My Shepherd’s Pie isn’t terribly fancy; I’ve mainly added cheese to those potatoes. Because I’m an American, and we like cheese in everything, lol! What makes the mashed potato topping for this Classic Shepherds Pie so good is a bit of Swiss or Cheddar in the mashed potatoes, but also on top. To get that beautifully browned crust, after the pie is in the oven and almost warmed through, brush the top with melted butter, then sprinkle on just a little finely grated cheese. If your cheese isn’t finely grated, run a knife through it to get fine little pieces. If the top isn’t browned enough to your taste when the Classic Shepherds Pie is done, turn on the broiler for a few minutes. The topping will have a gorgeous, delicate crispy crust that when cut through, reveals the creamy mashed potatoes and layer of meat and veggies, below. It’s a great strategy to buy your ground beef in larger packages when on a deep sale and divide into portions your family will use, then freeze it. Since the fat is drained, you can get by with using a cheaper grade of ground beef in this recipe. Carrots, Potatoes, and Onions are always cheaper in larger bags. Just don’t store the potatoes and onions together. I typically buy 10-pound bags of potatoes in the fall/winter when I cook with them more often and sort through the package. The larger, more uniform ones are saved for baking and the rest are used in recipes where size doesn’t matter. Tear a rip in your carrot package so the condensation can get out and turn them now and then when you think of it and they’ll last longer. Do buy your common grocery store cheese on special; you’ll typically pay anywhere from a third to half off the regular price. It will keep, wrapped and unopened, for weeks and can be frozen. After freezing, cheese will be drier and more crumbly so it won’t be so good for just slicing or eating but is fine grated. Season both the dish and the potatoes well with salt and pepper. Start the potatoes before starting the Shepherds Pie, and preheat the oven when the potatoes have finished boiling. The potatoes will need to be a good, heavy mash because the cheese, as it melts, will make them much softer. Cook potatoes in salted, boiling water until tender, about 15 – 20 minutes. Drain and return to hot pan. Mash by hand or whip using an electric mixer, add butter and enough milk to smooth them out. Salt and pepper to taste. Add a pinch of nutmeg and about three ounces of the cheese (3/4’s of it) and stir in by hand. Cover to keep warm and set aside while finishing the rest of the dish. In a pan, brown ground beef along with onion and carrots and cook beef is no longer pink and fat has rendered out. Drain well of any fat. Add the garlic, salt and pepper, and Worcestershire sauce (and parsley) and cook an additional two to three minutes, stirring often. Remove from heat and mix in peas. Spread meat mixture into the bottom of a casserole, top with mashed potatoes and smooth as desired. Bake at 350 degrees for a total of 30 minutes, brushing the top with melted butter and sprinkling with 1/4 of the grated cheese (see note) at the 20-minute mark. If, when the 30 minutes is up, the top of the potatoes hasn’t nicely browned, turn on the broiler for a few minutes, watching closely until the potatoes are golden brown. Remove the Classic Shepherd’s Pie and rest for a few minutes before serving. Note: The 1/4 of the cheese used to top the potatoes with should be finely grated. If not, run a knife through the cheese to break it down into fine bits. Nutrition: Per Serving (counting 6 servings): 401 Calories; 27g Fat (60.2% calories from fat); 21g Protein; 18g Carbohydrate; 2g Dietary Fiber; 90mg Cholesterol; 374mg Sodium. Exchanges: 1 Grain(Starch); 2 1/2 Lean Meat; 1/2 Vegetable; 0 Non-Fat Milk; 3 1/2 Fat; 0 Other Carbohydrates. 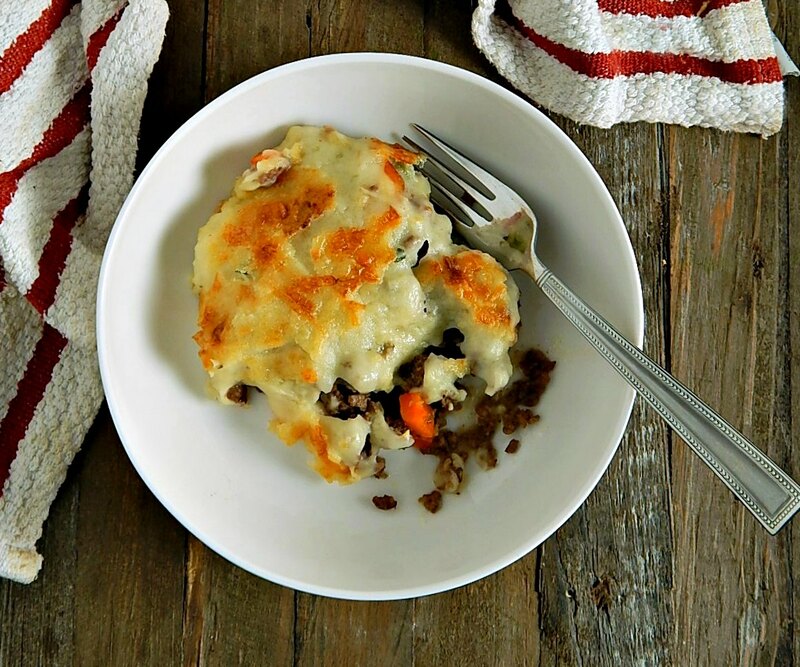 This entry was posted in Click here for Bargain Meals, Click here for Fabulous Food Posts and tagged Bargain Meal of the Week, Carrots, Cheese, Ground Beef, Heritage Recipe, irsh, leftover potatoes, leftover vegetables, Leftovers, mashed potatoes, Peas, Potatoes, shepherd's pie. Bookmark the permalink. Mmm… this sounds like a delicious shepherd’s Pie. Hi Deb, thanks!! The world of food used to be so much smaller, lol!! Hi Petra, to tell the truth, I wish I had some right now! Sadly, it’s all gone! You’re welcome, Kraig!! Love you!! This shepherd’s pie has always been delicious. Thanks Mom!